The Backwoods consists of two areas: the path leading up The Mountain from The Farm and a lower section that can only be reached by heading west along the road from the Bus Stop. The path in main section connects The Farm to The Mountain in an L-shaped curve, complemented by decorative bushes. Foragables can be found here in all seasons of the year and it is a great place to find Artifact Spots. The lower section connects the Bus Stop to The Tunnel. This area can be reached by the road from the Bus Stop, leaving the screen to the west. Forgeable items can found in this area, including Salmonberry and Blackberry bushes in their respective seasons. 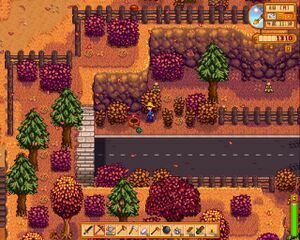 The Backwoods is only important to one quest: Linus' blackberry basket can be located in the lower section (near the road) at the right side of the screen. Although it can be seen from the upper path, the basket can only be reached by exiting the Bus Stop to the west along the road. This page was last modified on 29 October 2017, at 18:40.